Folk rock singer-songwriter Jack Johnson just wrapped up a month-long North American tour leg on October 20 supporting his latest album, From Here To Now To You. 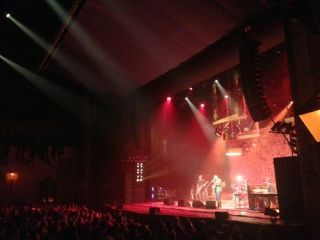 Camarillo, California-based Rat Sound Systems, which has been Johnson's live production provider in the States for the past 13 years, deployed a full L-ACOUSTICS KARA rig for the latest trek, which stopped at what the artist considered the "most beautiful and intimate" theaters across the continent. According to Systems Engineer Andrew Gilchrest, the Rat crew typically flew 15 KARA line source array enclosures below two SB18 subs per side, with an additional two SB18 per side set up on the floor. For venues with extended balconies, however, the left and right hangs were split into two arrays: eight KARA in the air, plus seven KARA positioned over two SB18 onstage for the orchestra level. LA8 amplified controllers powered and processed all systems. Although Rat Sound also carried four SB28 double-18" subs, they were never utilized due to the ample low end delivered by the more compact single-18" SB18 enclosures, which cover LF down to 32 Hz. "A number of the theaters on this tour had fairly deep balconies, so getting sufficient coverage below presented a challenge," Gilchrest said. "However, the ability to ground-stack a portion of the KARA cabinets on top of the subs solved those issues. Also, given the nature of Jack's music, his show isn't particularly loud but certainly needs to sound natural and clear, which this system excels at. KARA's size, flexibility and sound are fantastic and it was a great choice for the tour."